Woodworking machines are dangerous, particularly when used improperly or without safeguards. Download OSHA’s Guide for Protecting Workers from Woodworking Hazards (PDF) to learn more. Toxic and flammable solvents in adhesives, stains, paints and finishes. Corrosive, toxic and flammable paint removers and strippers. Cancer-causing ingredients in acid-catalyzed coatings. Toxic chemical compounds in some wood that can cause skin allergies and rashes, asthma, decreased lung function and severe eye irritation. Visit Toxic Woods (PDF) for information about harmful effects from exposures to specific woods. Wear chemical-resistant gloves when working with paint strippers and solvents. Wear gloves, goggles and protective clothing when working with corrosive paint removers. If contact with some woods causes skin allergies or rashes, wear protective gloves when handling them. Confine loose clothing and hair when working near motorized equipment. Wood dust is released at high speed, so it must be captured by a local exhaust ventilation system at or near the source. OSHA's Woodworking eTool (External link) provides recommendations for managing wood dust exposures in the shop. spray-applying solvent-based paint or adhesives. Choose water-based products like white glues instead of solvent-based products. Use paint-on adhesives instead of aerosol sprays. Read product labels and choose solvents, strippers and cleaners that don't list toluene or methylene chloride as an ingredient. Use mechanical equipment to remove paint in place of chemical strippers. Keep containers closed to prevent spills of toxic liquids and powders. Request a studio visit from a technical expert. We provide financial help to artists. Empty containers can be disposed in the trash once almost all the materials they held are gone. 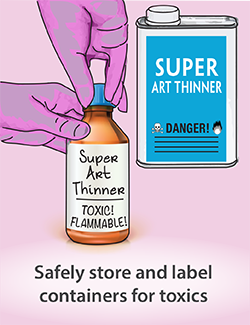 Learn how to dispose of your art studio hazardous wastes.